Modular, flame-retardant, and moisture-resistant pads act as the suspension system between the wearer's head and the helmet. 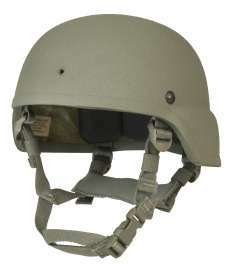 The cotton/polyester chin strap, a four-point design, allows for quick adjustment and includes a new Ballistic NAPE Protective Pad for the neck that adds ballistic protection between the bottom of the helmet shell and the top of the Interceptor Body Armor collar. The edge of the ACH shell is finished with rubber trim. Helmet: CO/PD 05-04, superseded by AR/PD 10-02.